How have we affected your handyman experience? Testimonials from Handymen and homeowners we’ve touched. The UHA is an organization that truly provides great “ bang for the buck”. The wealth of knowledge available is staggering and Flash’s daily drives are must viewing for any serious handyman. Keep up the good work. We can’t thank Flash and United Handyman Association enough. He not …only screened our handyman, he alerted us to the flags that he saw during his search and advised us on the consequences of using that handyman if we ignored the flags. We will be asking Flash to run a search BEFORE we hire the next handyman and any other household service workers. Thanks again, Flash, for all you do for us and the community! Much thanks to the United Handyman Association, I can’t express enough how valuable it is to have an organization screening handymen to make sure they are safe and the right person for the job. My experience using a handyman from referral to do electrical work caused other issues and could have been costly. The UHA quickly sent a safe and qualified professional to troubleshoot and remedy the situation. 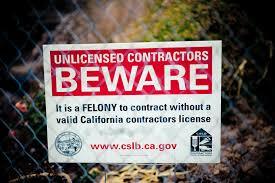 Hi, As a handyman in California I have to work within strict limits and always worried about contractor stings. My buddy was arrested in one and I was concerned. I became certified by the UHA because I felt it would give me the credibility as a business that I was looking for. I follow the business advice of the UHA and I’m no longer concerned about the state limitations. I still work within the law but the system that Flash shared with me has made a world of difference. More money, less stress and all legal. Hello all, So I am a handyman and I had trouble getting paid for a job. One of the limitations of being a handyman is I can’t file a lean on the customers property to get paid. Small claims court is an option but I’ve heard horror stories about handymen having to pay the customer because the court rules that your not a contractor. I turned to the United Handyman Association for mediation. They contacted my customer and managed to arrange a peaceful solution and remedied the misunderstanding. Result I got paid, The customers concerns were taken care of. All good thanks. I’m new to the UHA but I’m excited to be a part of an organization that is speaking out and concerned about how I make a living. I believe in the mission and I believe that when the minimum $$ are raised we can all make a good living. I guess I’m here because being certified for me means that I am a real business and My business should be certified to show the true value of the trade. I think every homeowner should and will require their handyman be screened and certified. I used the ask the handyman feature because I had an electrical issue. I changed a few outlets in a room and after I was done they no longer worked. I checked the power with the sensor and it had power so I was stumped. How could it me possible to have power but not work. So I wrote a question asking for help. I received a reply within minutes that I needed to check the neutral connections. white wire slipped out in the first box. Thanks Handyman.